Welcome to Candy Executive Coaches a family run Company and have been operating eight years within London,Surrey,Berkshire,Middlesex areas and more. All our drivers are uniformed hold a current DBS and CPC and the vehicles are maintained every 6 weeks to VOSA Standard and fitted with seatbelts throughout. Candy Executive Coaches Ltd currently holds a International licence. "Excellent communication prior to the trip and faultless experience. Thanks!" "Thanks Matt hope to do business with you in the future Carol"
"Thanks very much Candy Coaches. We took a group of excited Beaver Scouts to Chessington World of Adventures. The coach arrived early to pick us up which was great as it gave us a few more minutes to get the children ready. Both Carol and John (the coach driver) were very friendly and accommodating to our party. The coach was nice and just what we needed for the short 45 minute journey to Chessington. The coach was ready and waiting for us when we wanted to leave and head back to base. For the extremely reasonable price compared to other companies around our local area we got great value for money and WILL be booking again for another scout trip. I would very much recommend Candy Coaches." "Thank you we look forward to working with you again I have to say very polite children all said Thank you when they disembarked the coach Great"
"Great service. Arrived promptly for our initial pick up, and get us informed on the return of traffic issues. Would recommend and use again." "Many Thanks hope to work with you again"
"Coach did the job, got us there on time however the driver didn't seem fully sure of where he was going and relied heavily on the direction of the accompanying member of Candy Coaches staff. Took a while to get to the venue but did eventually. Easy to contact prior to the day and polite and friendly service from the sales team." "Thank you for the review. I find it a lot safer when I am on the coach to read sat nav so the driver concentrates on the road. 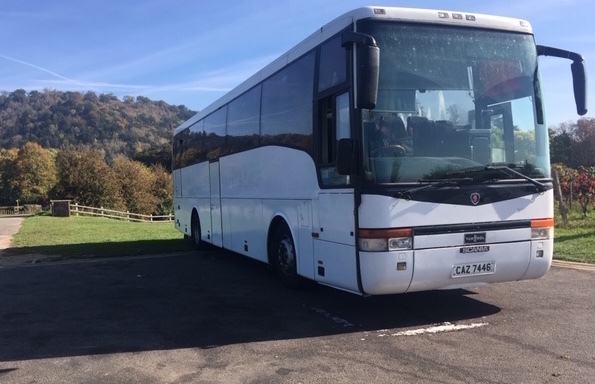 He was not 100% familiar with Horsham but sat nav gave the quickest way to the venue despite traffic"
"Pick up on time, coach absolutely fine for our requirements and clean and good condition. Collection a little complicated however did not deter from a good journey home on another good coach." "Thank you Gary I hope you all had an enjoyable trip"
"Thank you look forward to working with you in the future great bunch of people"
"Great communication and service with Candy Coaches. Coach was on time and safety-minded, driving a slightly longer way around to ensure children were dropped off on the school side of the main road. Excellent driver and assistant." "Thank you Adam and thank the children for being so well behaved a pleasure to work with them very polite a credit to your school look forward to working with you in the future Carol"
"Carol & Candy Coaches arrived just before the appointed time, the coach was clean and comfortable, and the whole journey went smoothly. Carol was very helpful and responsive. Price was competitive. Would definitely recommend." "The journey was excellent. Driver was very friendly, courteous and helpful. Coach was comfortable and clean. Would definitely recommend and hope to use again for 2019." "Many thanks glad all went OK look forward to hearing from you again Carol"
"It was a very smooth journey - Friendly driver, Which made our journey fun. Given the festive period it was extremely kind to be allowed to sing, cheer and enjoy a little festive drink with my work colleagues. The coach was huge ! very clean and really made the trip easier and worth while. We often travel as a work group so will definitely recommend to as many people as possible (I have even kept the contact information for personal use and events). A big Thank you to Candy Coaches !!!" "Many Thanks would love to work with you again and a Happy New Year to you and your team"